Spice and Seasoning should be this man’s middle name, however Chef Bonz is what her prefers. 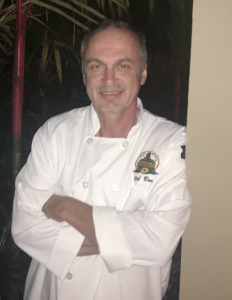 With thirty years of hotel and restaurant experience Chef Greg “Bonz” Heath is the expert when it comes to Hawaiian flavor. His spice and seasoning will make any dish taste better. Throughout his years Chef Bonz as created tasty dishes for visitors from all over the world. As a result many of his patrons asked if he could bottle his spice and seasoning so they could enjoy at home. In response, Chef Bonz created Lahaina Spice Company from his garage. He started with a few basic spice and seasonings and over time developed to the many available today. His spice and seasoning can be purchased in a retail outlets on Maui. In 2019 Chef Bonz partnered with Get The Spice to increase online sales and spread the word about his amazing spices and seasoning. To purchase his spice and seasoning online check out our Get The Spice shopping page.